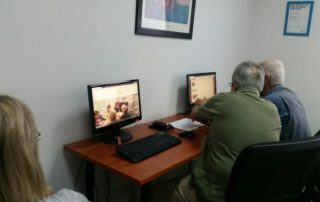 So far admin_wp_clear has created 28 blog entries. 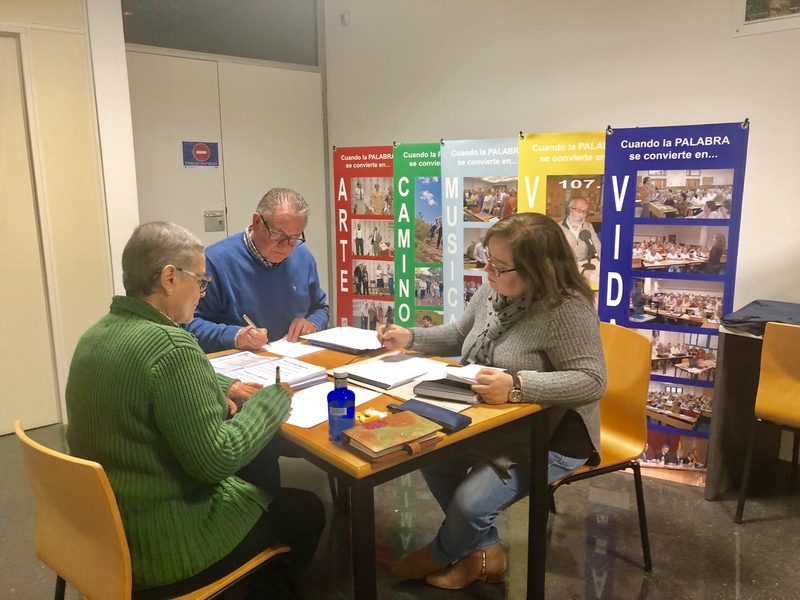 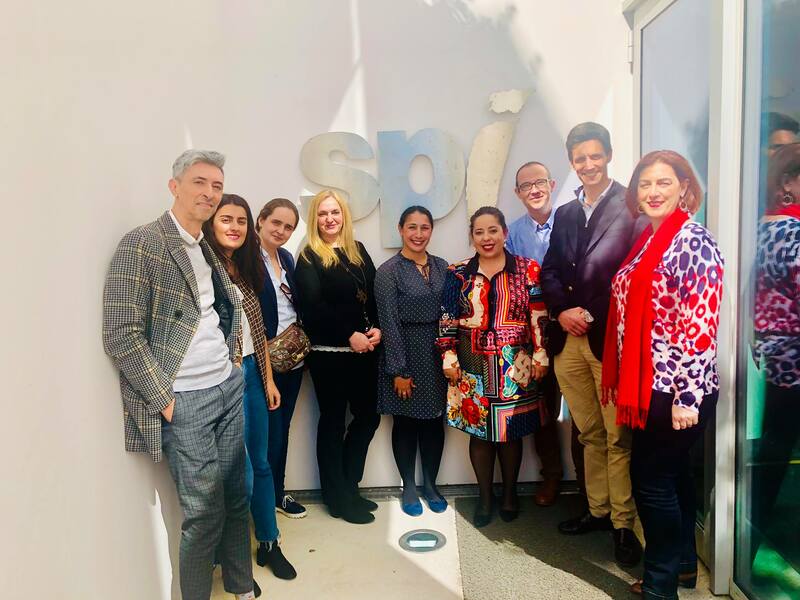 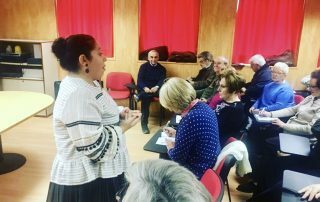 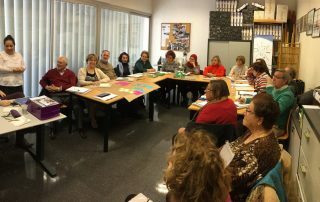 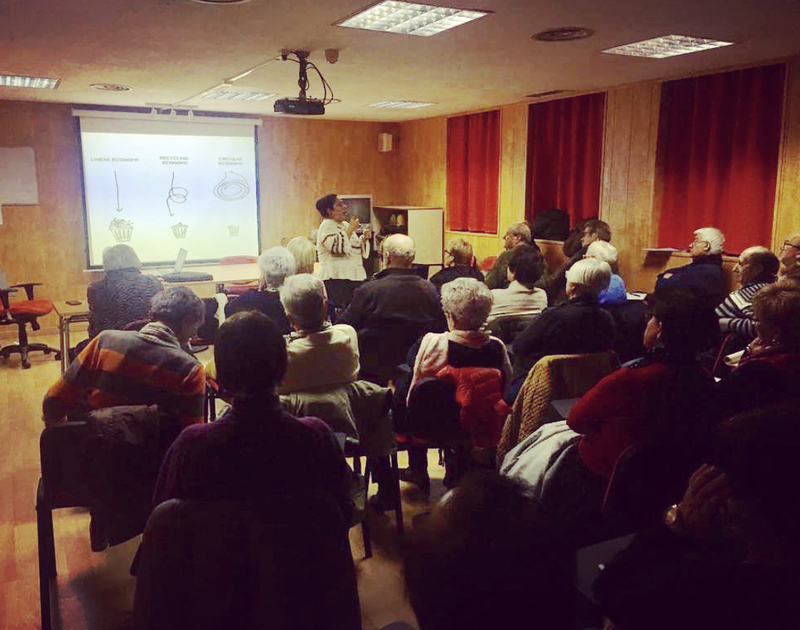 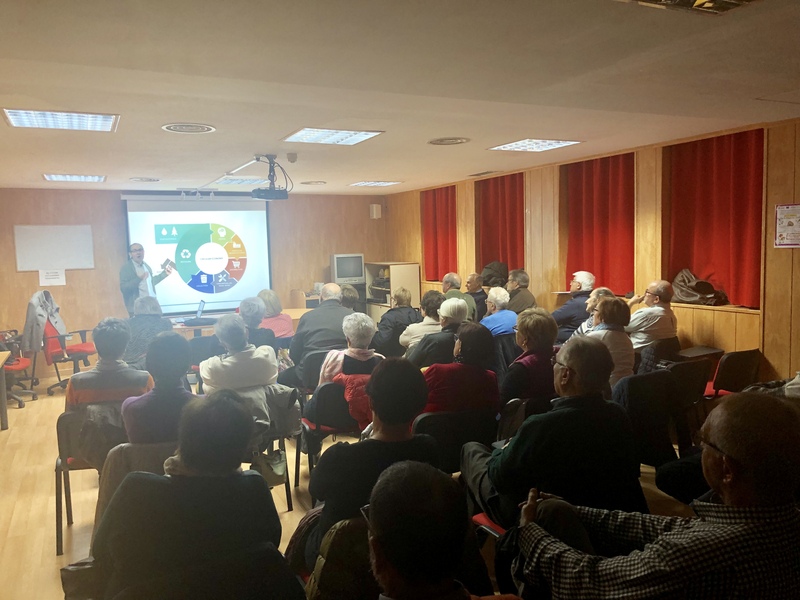 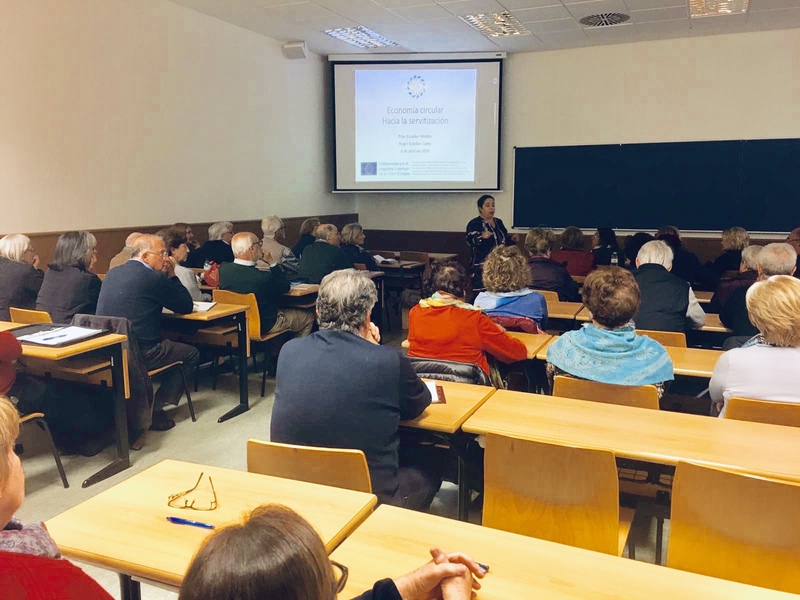 A group of students from the Senior Citizens’ University of Postgraduate course attended the master class taught by Pilar Escuder and Roger Esteller, on Monday 8th. 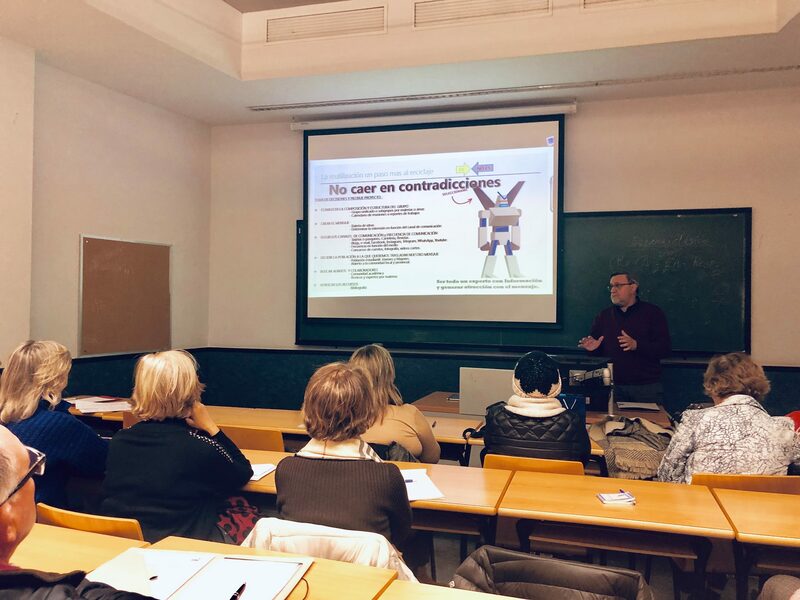 Around 45 students attended the session on circular conomy and servitization models, as well as information on the CLEAR project. 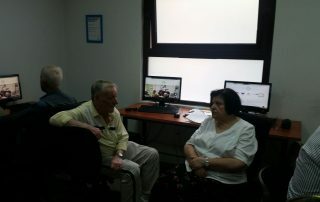 And now they have information about the project that is being carried out. 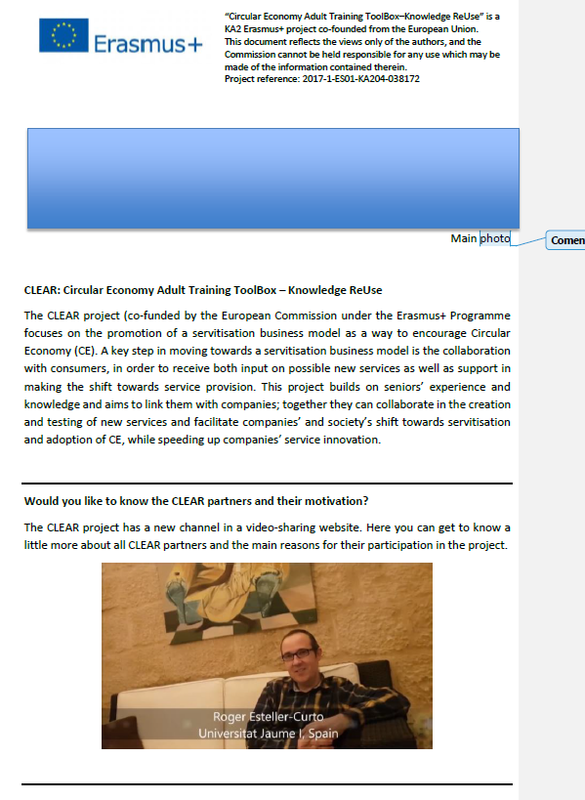 The first official communication of the CLEAR project is available, you can access by clicking here. 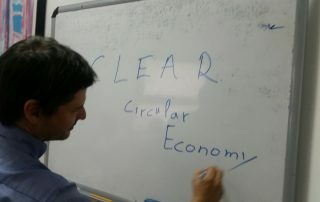 The second official communication of the CLEAR project is available too, click here. The objective of this project is to act through education, change attitudes and skills of students, trainers and educational managers, so that we can get a little closer to the objectives of sustainable development. Within the Clear project, the various established meetings are being developed. 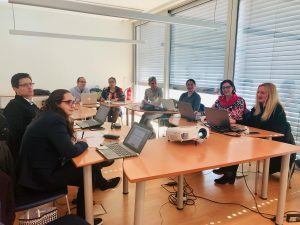 On March 18 -19, the fourth project meeting took place. 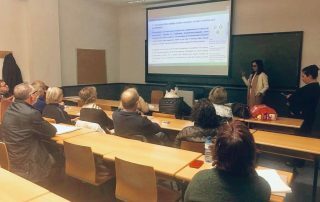 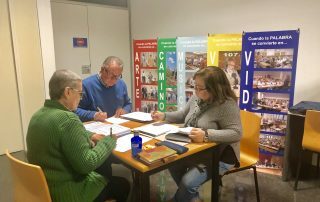 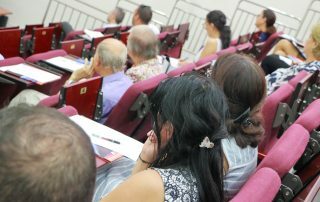 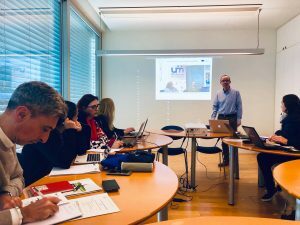 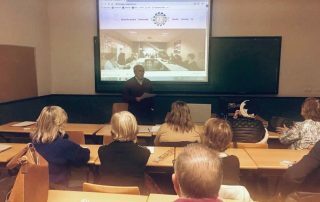 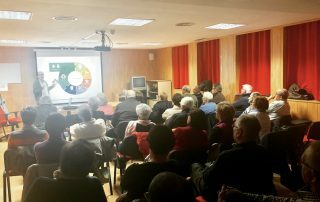 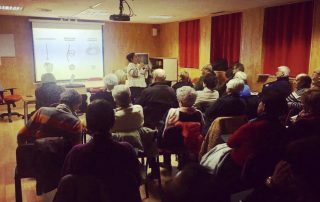 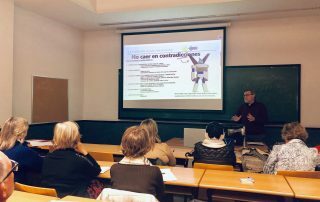 Awareness, review, change and generate new forms of sustainability, these are some of the concepts that have been worked on in the fourth meeting of the Claro project in which the University for Seniors, as coordinator of the same, has participated in Oporto. 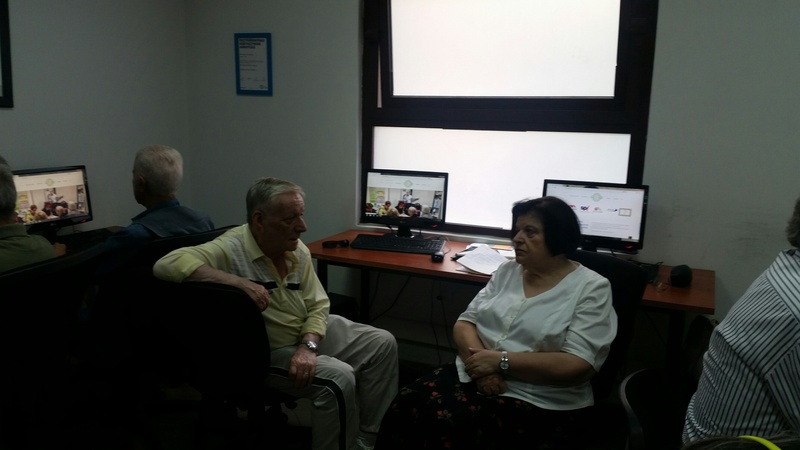 A group of Seniors citizens’ university, have been working about the re-use of knowledge. 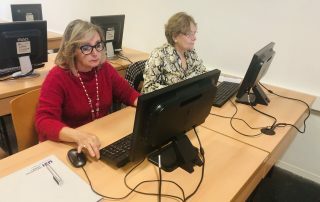 They wrote in a wiki, and they are aware that written knowledge can be reused, updating the content of published articles and improving it, so that it can reach the whole society. 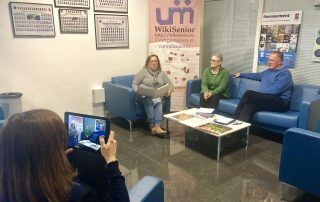 As a final activity they will be record a video with the importance about the re-use and how to do it in the WikiSenior. 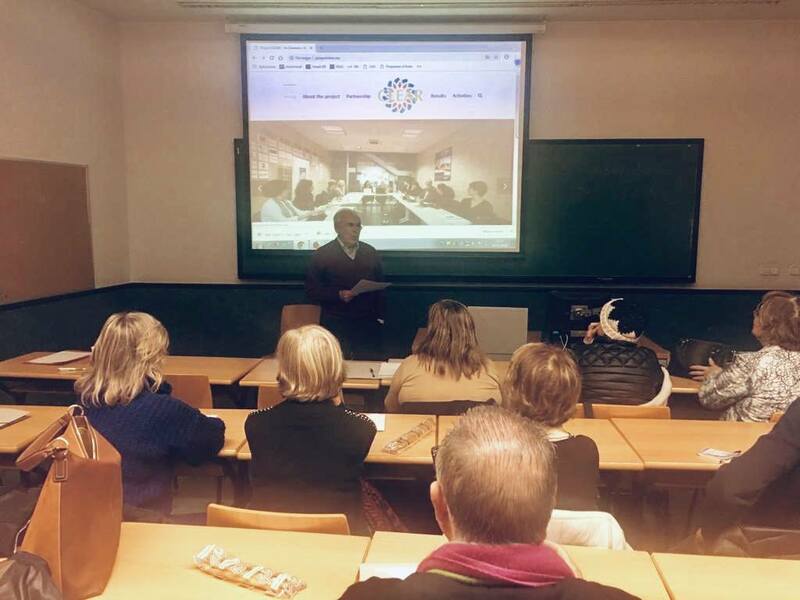 A group of 12 students of the Seniors citizens’ university, have met to work on the refletion and concretion of actions related to the CLEAR project. 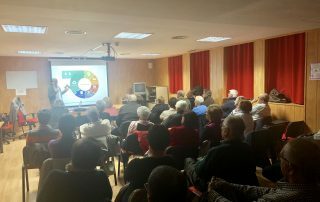 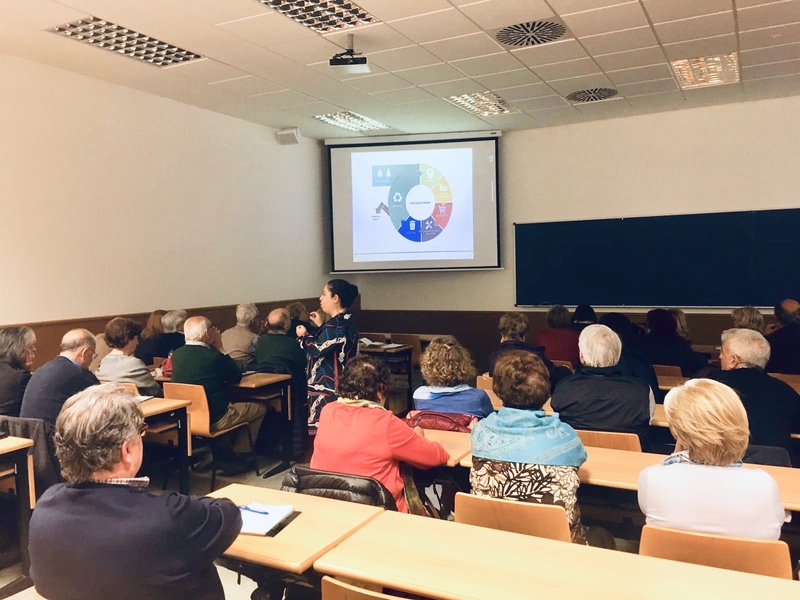 In this meeting the were wotking about the progress and the actions of dissemination of the project, so that all the students of the Senior Citizens University as well as all the society will know the Circular Economy and the Servitization. 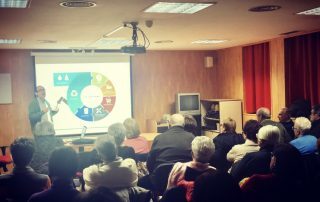 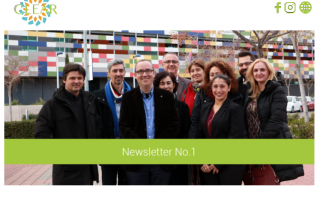 With a group of students from Segorbe (Castellón) Roger Esteller has carried out a master class with Pili Escuder, about how we are affected by the evolution of technology, global changes and new models of circular economy and servitization. 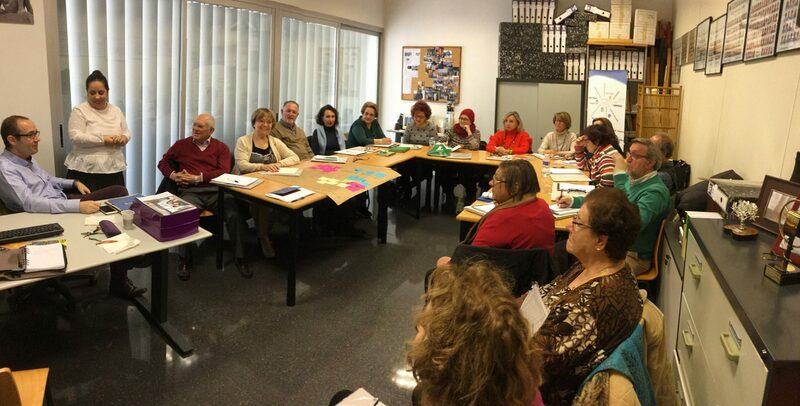 It has been a very effective way to teach, reflect and learn with the students of the Interior of Castellón. 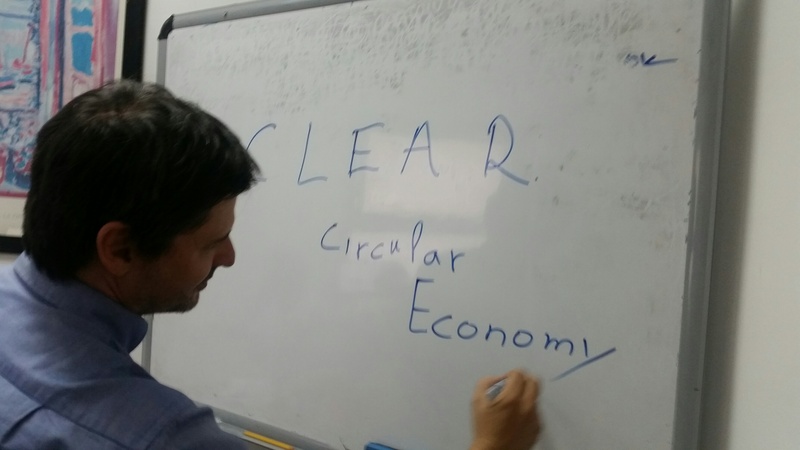 The second official communication of the CLEAR project is available. 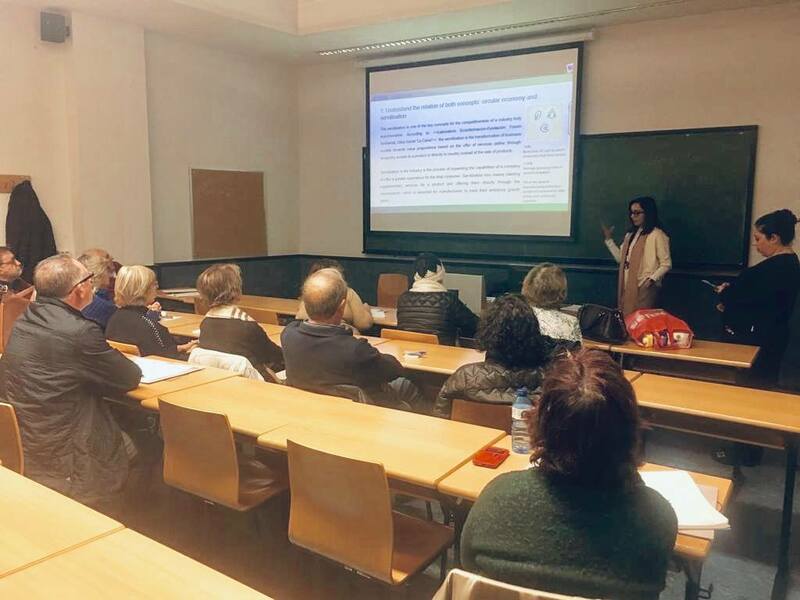 The objective of this project is to act through education, change attitudes and skills of students, trainers and educational managers, so that we can get a little closer to the objectives of sustainable development. 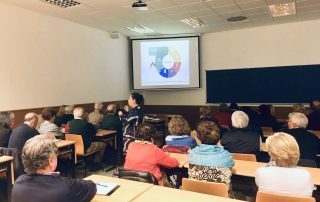 The next group work meeting will be Friday, January 11 at 10.30. in the spaces of the Universitat per a Majors, in which all the students of the program who are interested can participate. 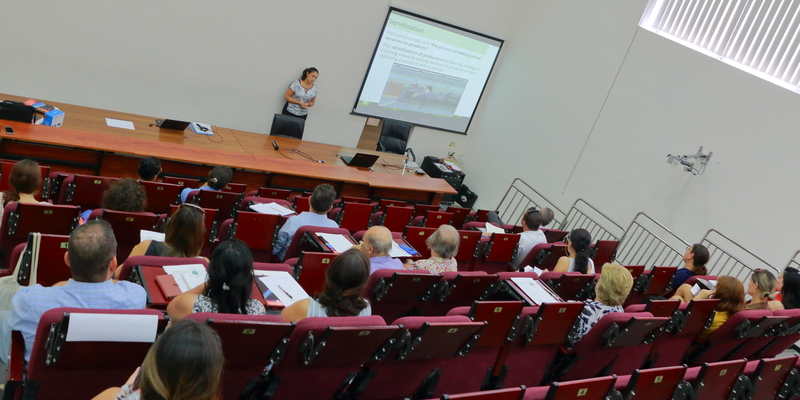 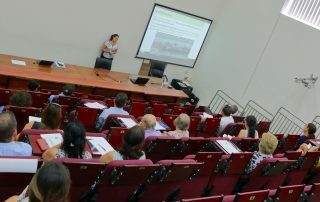 This seminar was jointly organised by MECB Ltd, a technical excellence and innovation consulting bureau and MCAST, Malta’s leading VET Institute. 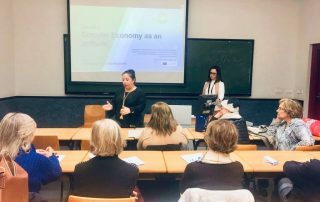 As was outlined in this morning seminar, CE is a driver for innovation in the areas of material, component and product-reuse as well as new entrepreneurial business models. 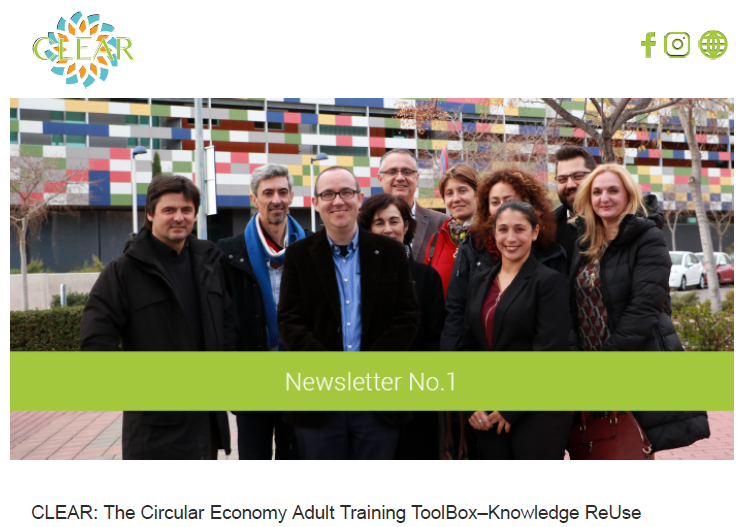 The concept of a circular economy approach is that of keeping raw materials and products in productive loops for as long as possible. 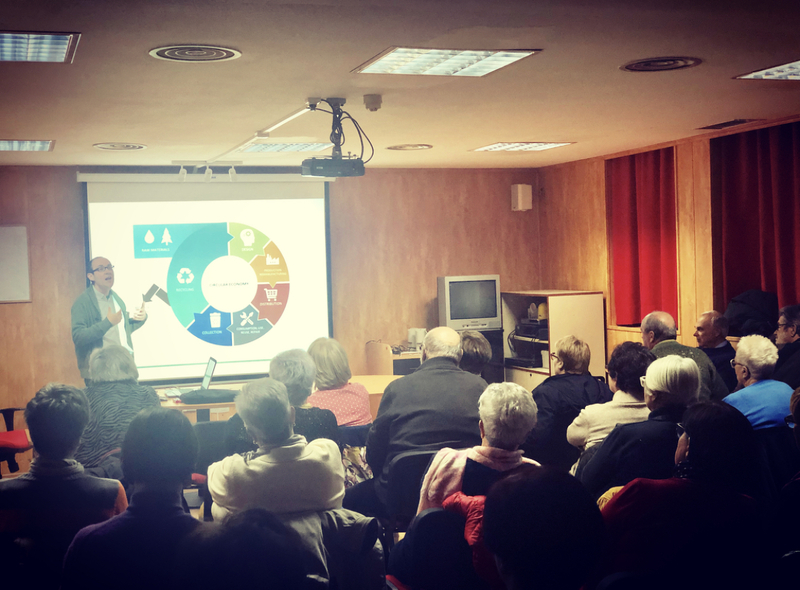 It is essentially concerned with designing waste out from industrial systems, making them less dependent on the extraction of resource reserves that are by default not infinite. 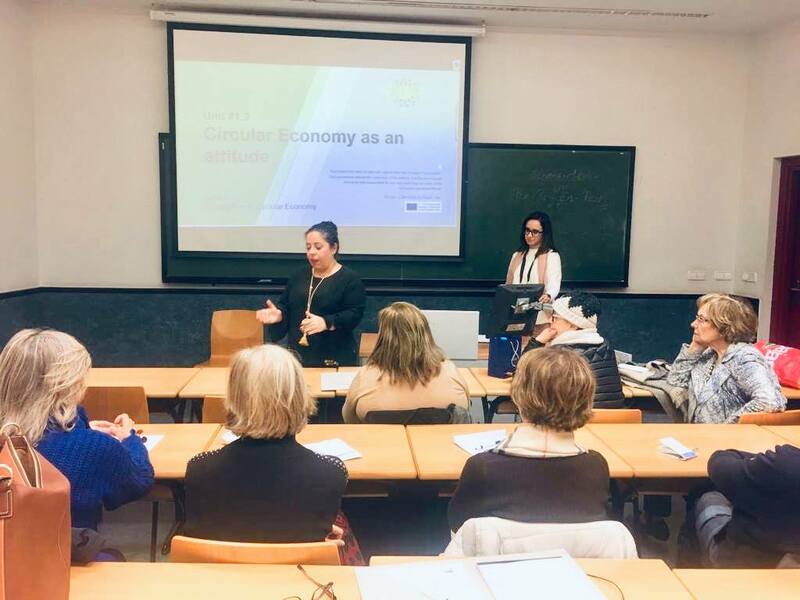 In this respect, this seminar introduced the concept of Circular Economy, related case-studies as well as introduced seminar participants to a free digital training toolbox complete with an e-learning course that will help them to learn more at their own pace and time. 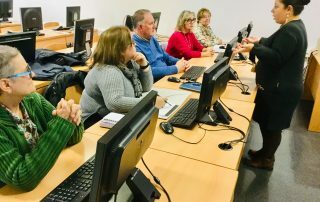 In addition, the e-Learning content making use of new digital technologies such as augmented reality provided participants with a set of resources they can freely use and edit for their own purposes. 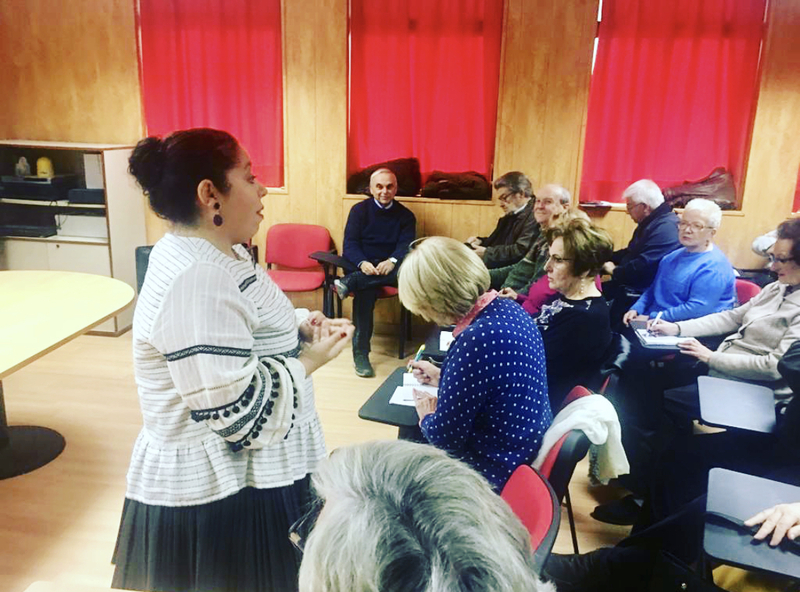 During the last month we had the opportunity to talk and provide to citizens of Korydallos that are participants to Adult learning projects the concept of CLEAR project. 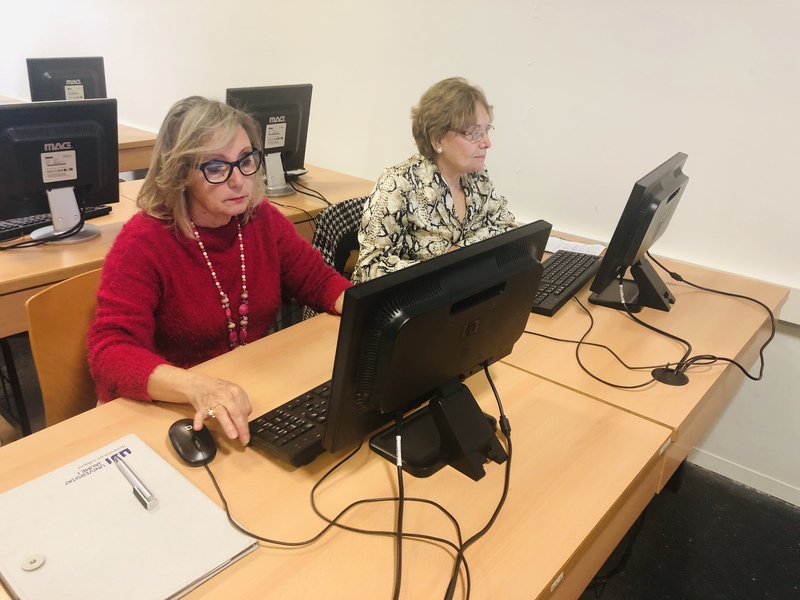 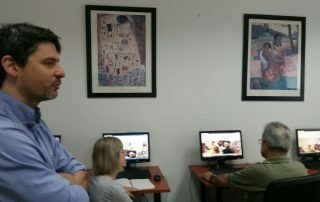 The participants of the workshop are students at the Municipal Centre for Adults’ Learning and all of them were pensioners and they were attending the courses for digital tools. 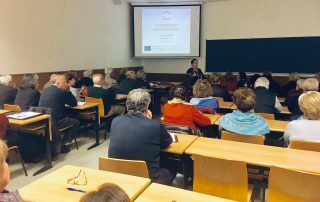 We had a fruitful workshop, based on a deep presentation of the CLEAR project, and a flourish discussion elaborating on people’s questions. 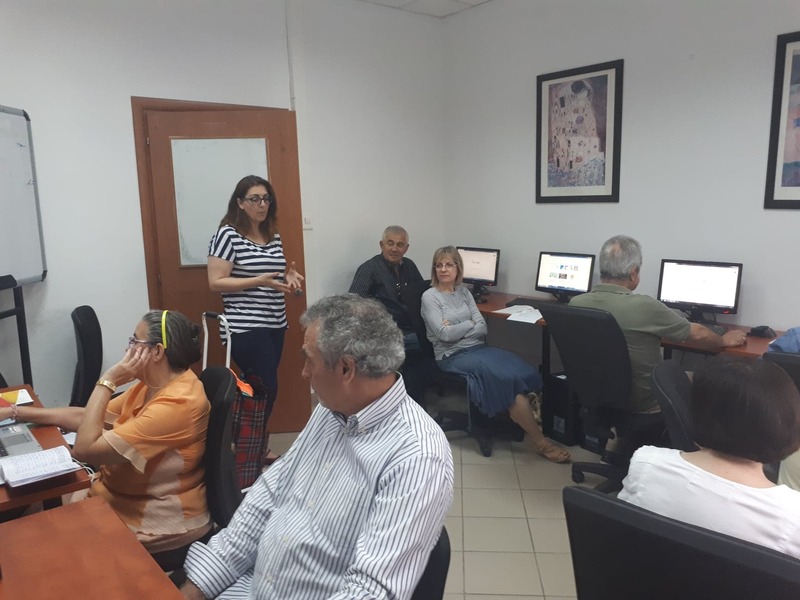 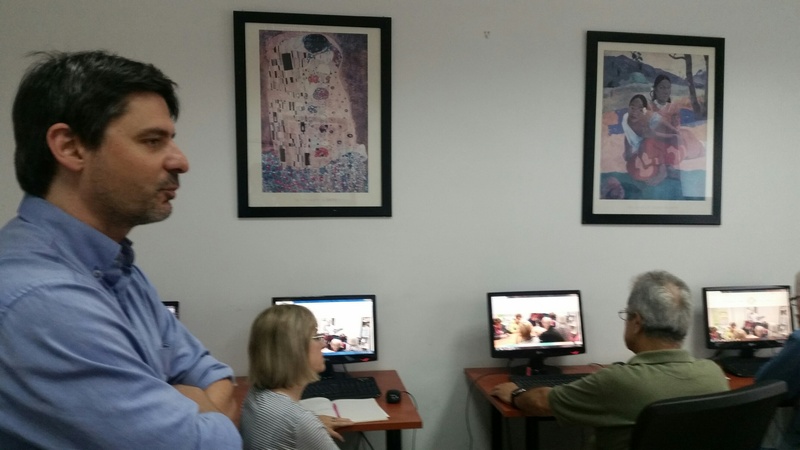 Through their course on digital tools they had the access to CLEAR webpage, as well Korydallos’ website and they explored by themselves all the units (photos, texts etc). 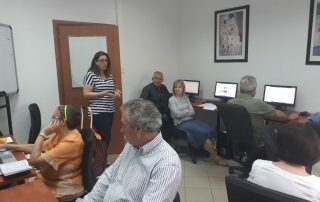 The most of them were very interested on CLEAR project. 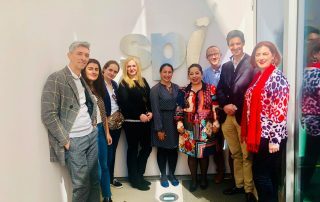 They liked a lot the transnational collaboration and they focused on the concept of social justice that had to be the first priority for such efforts. 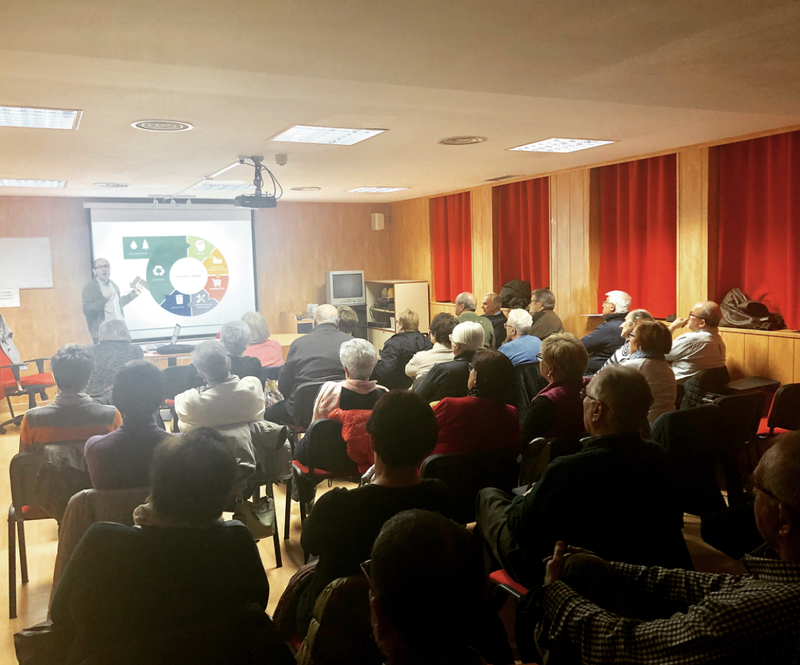 They also mentioned that such projects are very useful for our lives but still we have to be very concerned about institutional bureaucracy and corruption that such projects can be strongly affected by, resulting the loss of their impact to society.